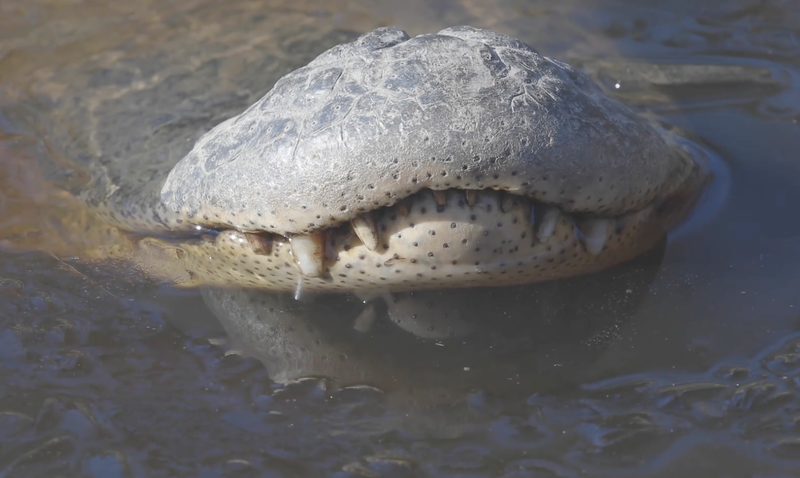 Alligators in a North Carolina swamp have allowed themselves to freeze with their noses above the ice. Bad winter conditions in America have created an unusual sighting at a swamp in North Carolina. The video was posted on Facebook by the Shallotte River Swamp Park in Ocean Isle Beach, N.C., showing the remarkable event. Apparently, the alligators did the same thing last year when they froze themselves to survive winter, but this year there are a lot more alligators in the same swamp doing the same thing. According to the park manager, George Howard, the alligators seem to sense when the water is at its freezing point and poke their noses into the air at the right moment. Apparently, it's the way they hibernate.